I should have seen it coming. After all, the topic of the conference was spiritual warfare. 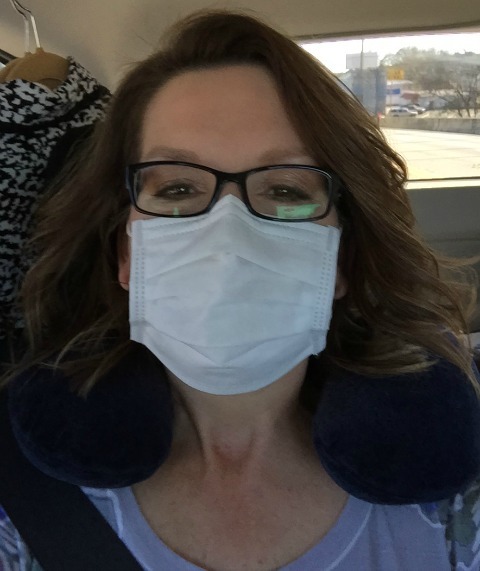 But praise the Lord, I was not contagious (hallelujah for Tamiflu) and, best of all, Satan did not get a victory at the FBC Linden Women’s Conference OR at any of our other Priority events in February. Glory! If you’re under spiritual attack, I pray the following pictures will encourage and remind you that God’s “grace is sufficient for you and [His] power is perfected in weakness,” (2 Cor. 12:9). Even if you have the flu. 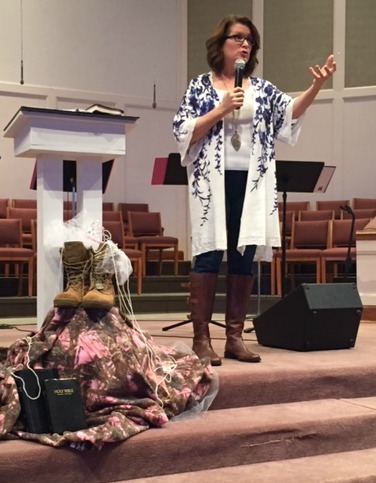 The Red Shoe Gala is one of the highlights of the year at Heights Baptist in Alvin, TX, and this year Priority’s own Emily Ryan was the keynote speaker. The theme verse of Height’s Women’s Ministry is Psalm 25:4: “Show me the path where I should walk, oh Lord. Point out the right road for me to follow.” So, to demonstrate their desire to do just that . . . 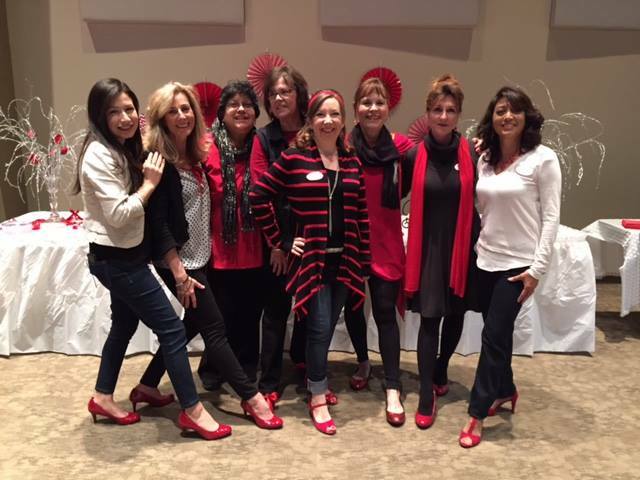 The Red Shoe Gala was born! It’s a great verse, and it was a great night! Emily’s sister, Meghan Garrett, attended the event with her and served at the Priority resource table. Thank you, Meghan! Heights Baptist Church is reaching, discipling, and ministering to women all throughout their city and the surrounding communities. 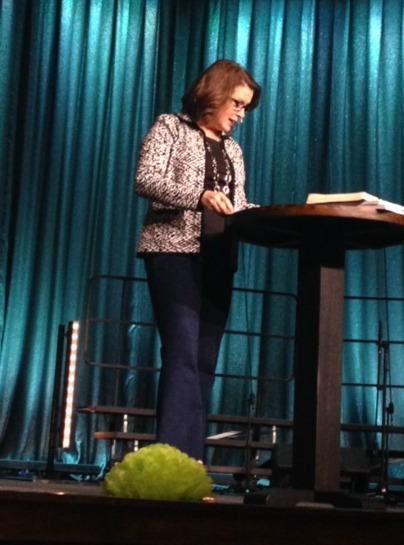 We thank the Lord for their Women’s Ministry Coordinator, Brenda McClelland, and for her heart to encourage women. Priority is so grateful to partner with Heights, and we look forward to future opportunities for outreach with this great church and women’s ministry! 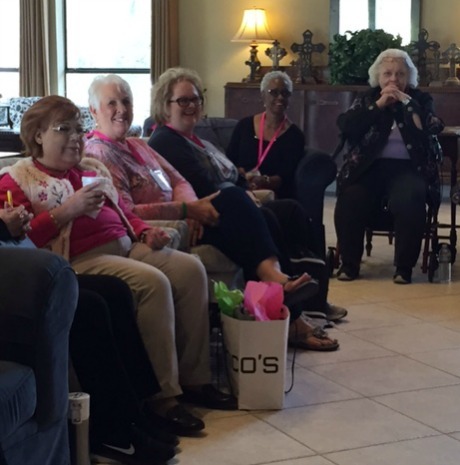 This was my second year to teach at the annual Sagemont Church Journey of Promise Widows Retreat, and it has truly become one of my all-time favorite ministry events. 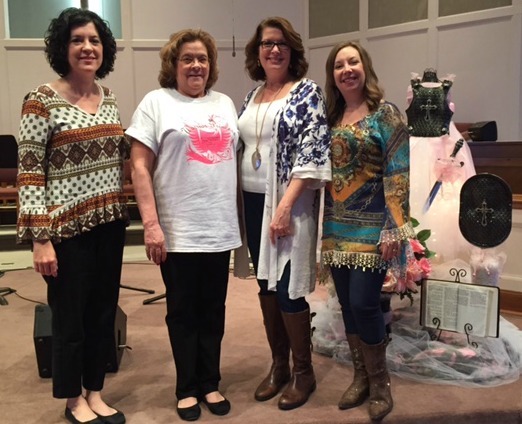 Led by Diane Zimmerman, a widow herself, this beautiful ministry brings widows of all ages together to support, encourage, and minister to one another. Some of the ladies have been widows for decades and others for only a few days. The conversations I enjoyed with them and the way I witnessed them sharing and ministering to one another that weekend was more precious than gold. If you’re a widow and you live in the Houston area, I encourage you to contact Diane Zimmerman to find out more information about Journey of Promise. Thank you, Diane, for your leadership! And thank you, dear sisters, for allowing me to be part of your journey at the retreat. I love you all, and I treasure the time God gave us together! 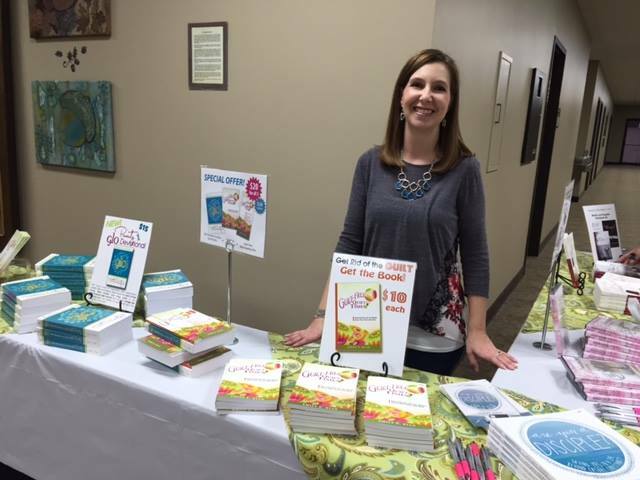 God is at work in a BIG way at Bay Area First Baptist Church in League City, Texas, and I was so privileged to witness it firsthand at their women’s gathering on February 24. I’ve been a fan of this church ever since my sons attended school there, but this was my very first time to be with the women of BAFBC for a women’s event. It was such a special delight to meet their pastor’s wife, Angela Haynes, and to enjoy a reunion with their Pastor of Discipleship & Biblical Counseling, Grant Rothberg (Grant grew up at Sagemont Church where his father is one of our favorite teaching pastors). As I said, all three of my sons attended school at BAFBC, and they all agree that their favorite teacher of all time is Mrs. Hunt . . . 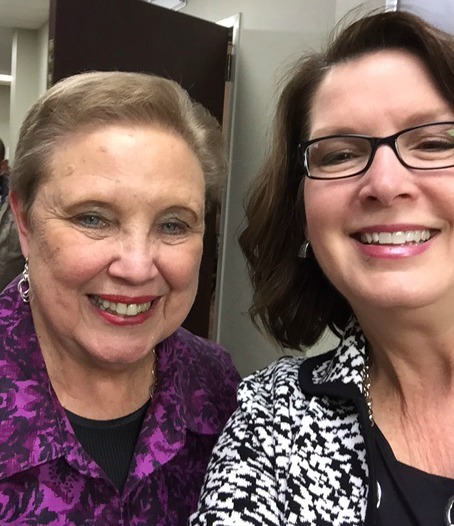 I was overjoyed to see her at the women’s gathering! My sons knows her as their second grade teacher, but she serves now as the Elementary Principal. 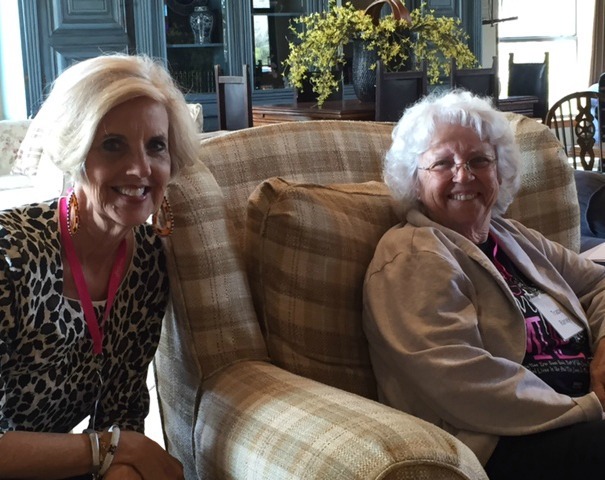 Thank you, Mrs. Hunt, for being a godly influence upon the lives of countless children! My reunion with Mrs. Hunt was only one of many that I enjoyed that night. But from my standpoint, there were far more new faces in the crowd that night, and my conversations with many of them confirmed that God is at work in a BIG way at BAFBC. Please pray for pastor Brian Haynes and the Bay Area Church family as they reach their growing community for Christ. 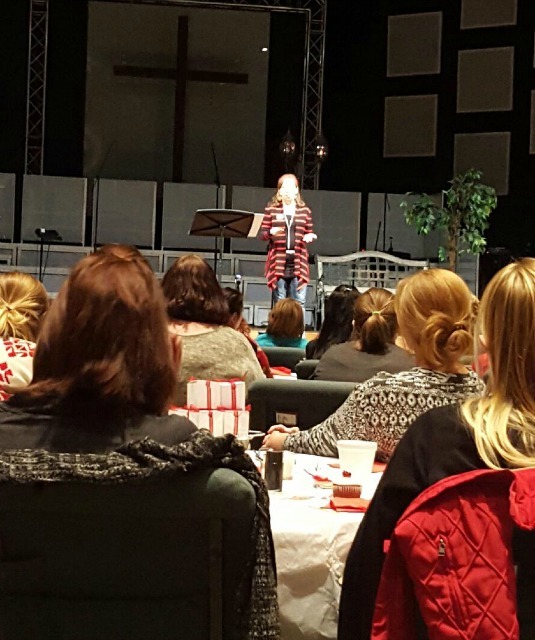 Sherry and the women at FBC Linden have a huge heart to encourage and equip the women in their area with God’s Word. 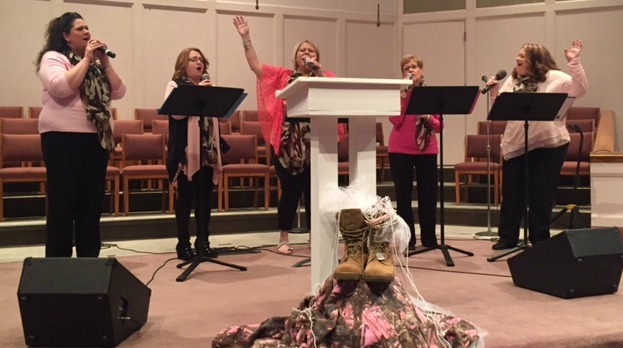 Their hospitality, friendliness, and spirit of service all throughout the weekend allowed every woman at the conference to experience God in a fresh new way. The Happy Girls led worship and praise for the event, and they truly made ALL of us happy as they shared and we sang with them. I include the following picture of me (with the flu) only as evidence of God’s power. When we are weak, He is strong! Thank You, Lord, for giving me the strength to teach your Word. Please remember Sherry, her husband Pastor Jackie Stanfield, and all of the churches in East Texas in your prayers. Because of the economic downturn in their area, they are facing enormous challenges and great spiritual warfare right now. Pray with me that they will “be strong in the Lord and in the power of His might . . . so that [they] will be able to stand firm against the schemes of the devil,” (Eph. 6:10-11 NASB). We love you FBC Linden. Thank you for your love for the Lord, His church in East Texas, and for others! That’s the scoop for March! Thanks for your interest and support for Priority Ministries. We would love to partner with you and your church to reach and teach God’s Word to women, so please feel free to contact us. Know of our love and prayers for you as you seek Him first and give God priority!